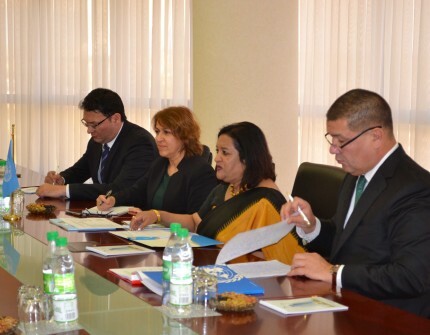 On December 10, 2018, at the Ministry of Foreign Affairs of Turkmenistan there was a meeting with the delegation led by Ms. Ashita Mittal, Regional Representative for Central Asia of the United Nations Office on Drugs and Crime (UNODC), who arrived in Ashgabat on a working visit. At the beginning of the meeting, the Turkmen side thanked the UNODC regional representative for accepting an invitation to participate in the events dedicated to International Neutrality Day and the active participation of UNODC representatives in various international forums held in our country. Then, during the meeting, the parties considered a number of issues related to the draft Plan of Practical Measures (“roadmap”) on further cooperation of Turkmenistan with UNODC for the period from 2019 to 2021. Also, having highly appreciated the results of the work done by the Government of Turkmenistan in the field of drug control and crime prevention, an exchange of views took place on the further expansion of cooperation between Turkmenistan and UNODC. Highly appreciating the effectiveness of bilateral cooperation and, having reviewed the achievements of the Turkmen customs service, the sides recognized the efforts of Turkmenistan to integrate into the world economy and open new international trade relations successful.